The soil gas element of the project sought to establish baseline conditions for the concentrations of gases in the soil, flux of key gases from the soil to the atmosphere and near-ground atmospheric levels of gases. There is therefore some overlap with the atmospheric monitoring (see Atmospheric composition). Since radon was measured at a subset of the surveyed locations there is also some linkage to the radon work (see Radon). Baseline soil gas measurements, like those for the other elements of the project, provide a basis against which to assess any future changes that might result from shale gas-related activities. Although of low probability, there is the potential for gas to escape from depth along geological pathways (faults, fractures and other higher permeability zones) or man-made features, especially wells (either pre-existing or drilled for oil/gas exploration, evaluation or development). The more extensive monitoring carried out in the previous phase of the project (Phase 2) is described in Ward et al. (2017). The soil gas monitoring was restricted during this phase of the project to continuous monitoring. 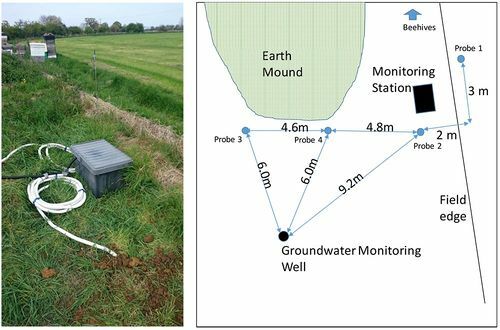 This included measurements with automated flux chambers and a scanning methane laser system located at the shale gas well site (KM8), a soil gas monitoring station at a farm to the east of Kirby Misperton and the operation of an eddy covariance (EC) system near Little Plumpton (the Fylde). Site selection was based on a mixture of scientific and pragmatic considerations and the general principles are described in more detail elsewhere (Smedley et al., 2015). At KM8 and Little Plumpton the equipment was located close to the air quality and greenhouse gas atmospheric monitoring instrumentation and measurement points. Thus equipment was sited at, or very close to, the proposed shale gas wells. The farm site is close to groundwater monitoring boreholes where high baseline methane concentrations have been measured. The eddy covariance system has operated throughout the year with data downloaded during monthly site visits by Manchester University staff. Monitoring has been more or less continuous with only very rare loss of measurements resulting from downloading or data corruption issues. The flux system at KM8 had to be removed on 27th September 2017 as Third Energy were making major changes at the site and planned to move the air monitoring cabinet in which the flux analyser and multiplexer units were installed. One of the flux chambers was found to be faulty and the opportunity was taken to carry out repair and general servicing of the system. The equipment was re-installed on 23rd January 2018. The soil gas station has operated over most of the period from May 2017 with some downtime for servicing and repair. Telemetry of the data was implemented allowing regular checks on the system and remote data downloads. There have been major problems with the scanning laser system. It has been returned to the manufacturer in Canada for servicing and repair. The major changes on the KM8 site in the autumn of 2017 precluded the re-installation of the equipment and so the opportunity was taken to carry out a major upgrade of the equipment. It will be available, in a significantly improved form, from April 2018 and can be re-installed at the KM8 site now that it is more easily accessible. While not ideal, establishing the CH4 baseline is not solely reliant on the scanning laser system, as we also have supporting methane data from atmospheric monitoring. The scanning laser system is expected to be back in operation well in advance of renewed site activities taking place. 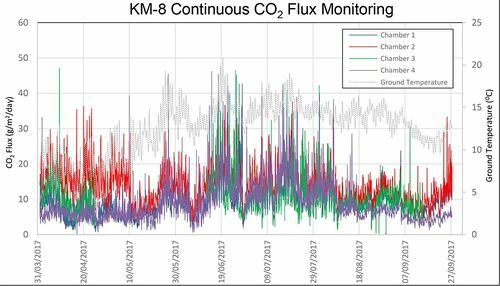 Continuous CO2 flux data have been acquired from the KM8 well site near Kirby Misperton during the period 14 October 2016 to 27 September 2017, almost a full year of measurement. Data for the period 01 April 2017 to 27 September 2017 (Figure 101 (combined data) and Figure 102 (individual cells)) are described below and compared with measurements made during the previous year. Figure 101 Continuous time series plot of CO2 flux from chambers 1, 2, 3 and 4, along with ground temperature. Data are continuous for chambers 1, 2 and 4. There is a break in data recorded from chamber 3 between 25/04/2017 and 12/06/2017 and also from 15/09/2017 until the end of data acquisition on 27/09/2017. This was due to water ingress through a faulty seal around the chamber actuator mechanism housing which caused damage to the internal electrical circuit. 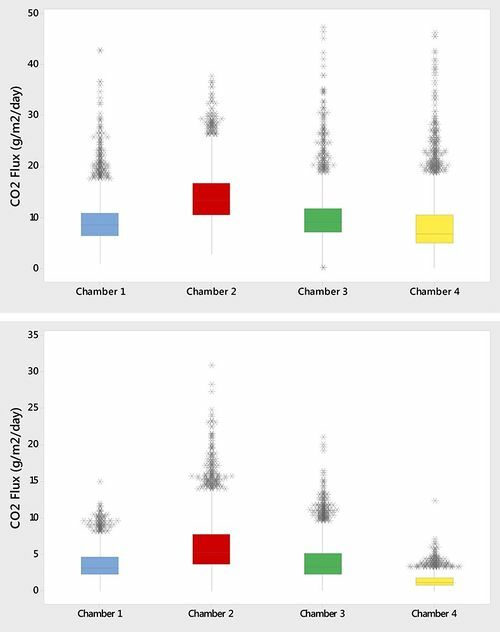 Figure 102 Individual continuous time series plots of CO2 flux from chambers 1, 2, 3 and 4, along with ground temperature. 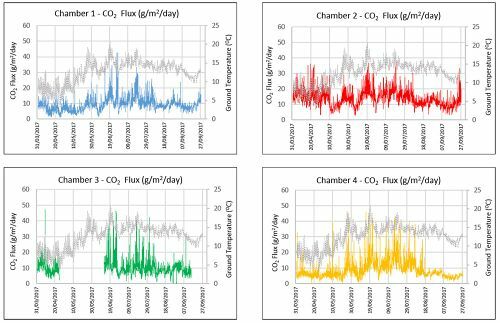 The overall trends from all four chambers are very similar, generally displaying lower CO2 flux during the colder months of March, April and September, when plant growth and microbial activity is reduced, thus producing less biogenic CO2. 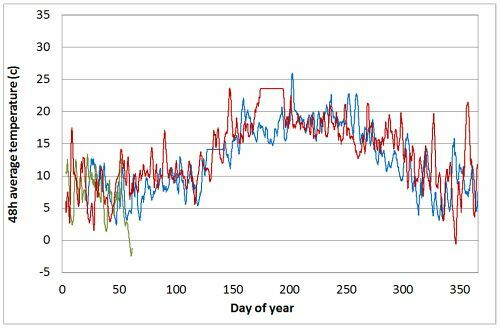 Data for all four chambers show higher fluxes during May, June, July and August, corresponding with elevated ground temperatures and associated plant growth and microbial activity. The data show discernible diurnal components and also longer lasting features which likely reflect weather conditions, particularly rainfall. Heavy rain can cause the ground to become saturated, resulting in water ‘sealing’ the surface and preventing the migration of gas to the atmosphere. 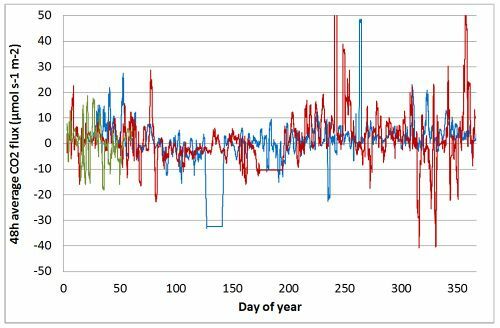 This effect is seen in all four chambers between 28th and 29th June 2017 where a sharp decrease in flux can also be related to a coincident drop in both atmospheric pressure and ground temperature. 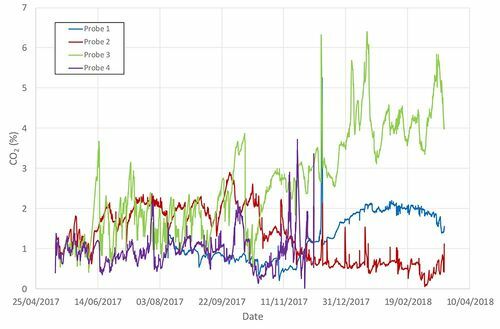 A slight rise in flux values is seen in chambers 1, 2 and 4 towards the end of the period of continuous data recording, and is concurrent with an increase in ground temperature. Data were not recorded from chamber 3 at this time due to the water-damaged circuit board. As with the data recorded up to 31st March 2017, the measured fluxes are relatively low, with chamber 2 typically displaying slightly more elevated values, particularly in the period from 1st April to 10th May. The reason for this is unclear, however the heterogeneous nature of the site and the proximity of the chamber to recently planted saplings may be influential. Flux concentrations from chambers 1 and 3 are very similar and are again consistent with those previously measured at the same locations. Similarly with chamber 4, which, whilst displaying a very similar overall trend to the other three chambers, generally shows slightly lower flux values, particularly when ground temperatures are colder. The relative flux relationships between chambers were the same in 2017–18 as seen in 2016–17. Absolute flux levels were lower in 2016–17 as the data cover October to March, largely the autumn-winter period of lower biological activity rather than the April to October period measured in 2017–18 (Figure 103). Figure 103 Summary of CO2 flux data at KM8 during 2017–18 (top) and 2016–17 (below). The flux values measured continuously at the KM8 site are in good agreement with those measured during discrete surveys at nearby farms A and B over a previous, but similar, time period. 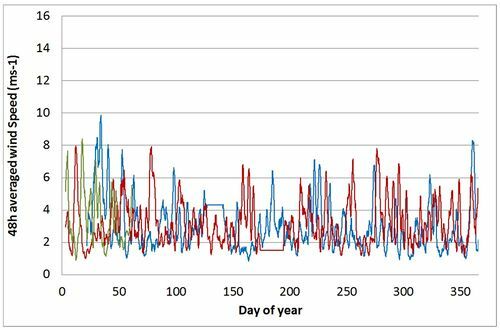 This illustrates the increase in CO2 flux during the summer months where crop and surface vegetation growth, and accompanying microbial activity, are at their highest rate, resulting in a greater contribution of biogenic CO2 from the soil to the atmosphere. Peak values observed at KM8 are typically between 35g/m2/day and 45g/m2/day during the months May–August, which is similar to the bulk of data from farms A and B, shown as boxplots below (Figure 104). Figure 104 Summary of data (boxplots) from survey flux measurements at two farms east of Kirby Misperton. The soil gas monitoring station east of KM8 was operational from the beginning of September 2016 until 3 March 2017 with a gap for maintenance and repair in November 2016 (Figure 105). After a period of routine maintenance it was reinstalled in a slightly different configuration in early May 2017 (Figure 106) and has operated since then, although one probe has been out of commission since December 2017. This has now been repaired and can be redeployed. The other three probes have functioned for almost a full year (Figure 107) with much less down-time than in 2016–17 (Figure 105). Figure 105 Summary of all continuous soil gas data for the monitoring station east of Kirby Misperton during 2016–17. Figure 106 Soil gas monitoring station appearance (left) and layout in 2017–18 (right). Figure 107 Summary of all continuous soil gas data for the monitoring station east of Kirby Misperton during 2017–18. The highest CO2 values in both years were recorded by probe 3 in the winter months of January to early March. Relatively higher values were also measured by probe 1 at this time, although probe 2 gave relatively low concentrations during this interval. Wet surface layers can impede the flux of gas from the ground and lead to a build-up of gas in the soil. Saturation of the soil may also explain the subdued response of probe 1 during this winter period. Differences between the probes likely reflect small-scale variability in ground conditions in the monitored area. This may also explain different patterns of response between the probes. 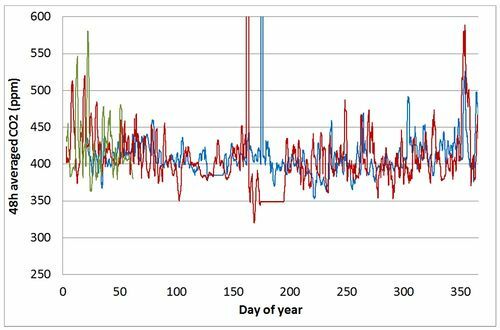 Conversely there are also coincident peaks and troughs of CO2 concentration seen in the different probes and a fuller analysis with meteorological information could probably tie these to specific events such as rainfall accompanying the passage of weather systems. Continuous EC data have been acquired from the Little Plumpton site during the period 19/01/2016 to 02/03/2018. There were two periods where data was corrupted and could not be recovered. These are 04/05/2016 to 19/05/2016 and 21/06/2017 to 13/07/2017 and are represented by the flat lines in the time-series data. To allow easier comparison and remove diurnal variation, where a time series is presented the data has been smoothed using a 48h moving average. Overall the range of data from each year is comparable to the other years. This gives us greater confidence that the values being observed are representative of the background for the site. As expected, air temperature for each year (Figure 108) shows the seasonal trends of cooler temperatures in the winter months and warmer summer months, where there is less variation. 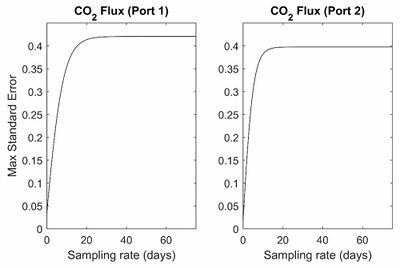 The CO2 flux (Figure 109) mirrors the temperature data, with higher fluxes observed during the cooler months when there is less biological activity. The broadly negative flux observed between day 75 and day 200 is representative of the ground is acting as a CO2 sink. The positive values during the rest of the year suggest the ground surface represents a source of CO2. The peak in CO2 concentration (Figure 110) also broadly mirrors the temperature, with the greatest concentrations occurring during the summer months. The minimum CO2 concentration stays broadly the same (c.370 ppm) throughout the year. 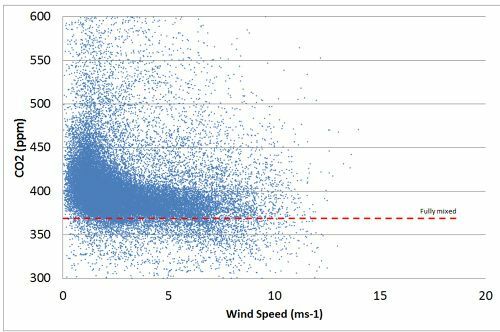 Wind speed (Figure 111) ranges between 1 and 7 m/s1 throughout the year with similar values observed for all years. When plotted against CO2 concentration the fully mixed concentration can be derived (Figure 112). This represents the regional/background CO2 concentration and is in alignment with that calculated from the time series of concentration (ca.375 ppm). Finally, seasonal CO2 concentration is plotted against wind direction (Figure 113). Since the site is close to the west coast of the UK, CO2 concentrations are more tightly grouped at lower concentrations when the wind is from a westerly direction when relatively clean air is reaching the instruments from the Irish Sea. Figure 108 Yearly time series plot of air temperature for 2016 (blue), 2017 (red) and 2018 (green). Figure 109 Yearly time series plot of CO2 flux for 2016 (blue), 2017 (red) and 2018 (green). Figure 110 Yearly time series plot of CO2 concentration for 2016 (blue), 2017 (red) and 2018 (green). Figure 111 Yearly time series plot of wind speed for 2016 (blue), 2017 (red) and 2018 (green). Figure 112 CO2 concentration plotted against wind speed. The red line represents the approximate background regional CO2 concentration. 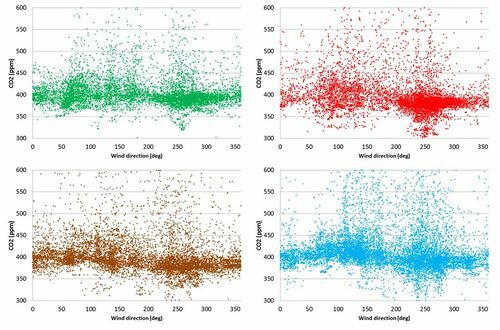 Figure 113 Seasonal CO2 concentration plotted against wind direction for spring (green), summer (red), autumn (brown) and winter (blue). An initial statistical evaluation of soil gas datasets was carried out to examine spatial and temporal variability. The spatial distribution of survey observations was assessed on the basis of a geostatistical model using prior information on likely sources of variation and analysis of the data. The developed model can potentially be used to support decisions on sampling requirements for any future monitoring that is required during baseline and operational phases of shale gas development. 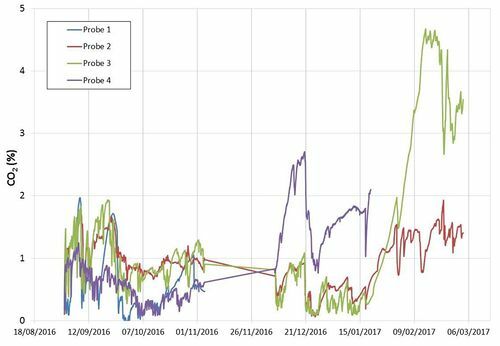 A critical consideration in ongoing monitoring of soil gas concentrations (or equally fluxes) is the number and frequency of measurements (i.e. the sample design) that are required to produce a meaningful estimate of the soil gas status. The accuracy of any estimate of soil gas status will vary according to the number of measurements and the amount of variation in the soil gas concentrations. 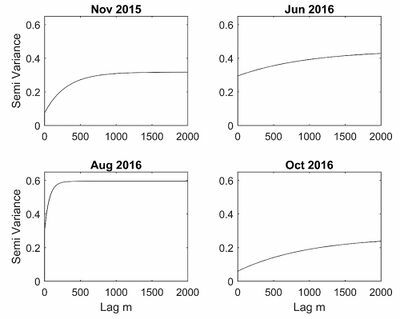 Now that we have measurements over two years of monitoring, we are in a position to assess the degree of spatial and temporal variation in the observations and the implications for our sampling requirements. The first stage of such an assessment is to decide the exact spatial and/or temporal scale over which we wish to predict the soil gas concentrations. For instance, we might wish to determine the field scale average concentrations or alternatively we might wish to continuously map the variation of the concentration. Both estimates will be subject to uncertainty. For example, Figure 114 (left) shows a geostatistical prediction of the variation of CO2 flux across a field in November 2015. Note that geostatistical models require that the observations are normally distributed whereas the CO2 fluxes are highly skewed. Therefore, we shifted and log-transformed the data prior to predicting this map. Figure 114 (right) indicates the uncertainty associated with the predictions at each site. It is clear that the expected errors increase as the predictions move away from the measurement sites (although larger errors are also evident at the field edges). Figure 114 Geostatistical prediction of log (CO2 flux + 0.2) with measurement locations denoted by black dots (left) and associated standard errors (right). Units are log(g/m2/d1). Both the predictions and the standard errors shown in Figure 114 depend on the spatial variability or correlation of the flux measurements. This spatial variation can be expressed in terms of a variogram (Webster & Oliver, 2007). The variogram describes how the expected squared difference between two observed values increases as the distance between the two measurements increases. The variograms shown in Figure 115 for log (CO2 flux + 0.2) were estimated by residual maximum likelihood (Lark & Cullis, 2006) from the measurements made in each field campaign. Some differences in these variograms from different campaigns are evident. The total variation is largest in the June 2016 and August 2016 campaigns whereas measurements made a small distance apart are most similar for the November 2015 and October 2016 campaigns. Figure 115 Maximum likelihood estimates of variograms for of log (CO2 flux + 0.2). Once we know the variogram for a particular variable it is possible to use it to calculate the uncertainty associated with spatial predictions of that variable based on any proposed set of measurement sites. For example, we consider 81 soil gas measurements positioned on a regular square grid and the prediction of the CO2 flux at the very centre of that grid so that the prediction site is equidistant from the four closest measurements. 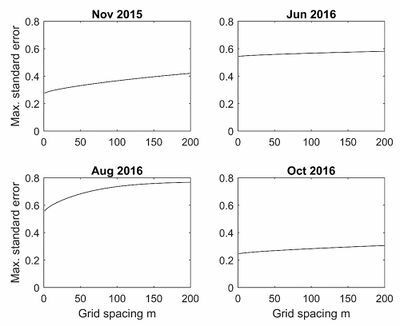 If we increase the grid-spacing we can explore how the standard errors increase as the measurement intensity decreases (Figure 116). Figure 116 Standard errors for spatial log (CO2 flux + 0.2) predictions at the centre of 81-point regular square grids of different sizes. The rate of increase in errors reflect the variograms shown in Figure 115, with the largest errors occurring in June and August when the fluxes are more variable. 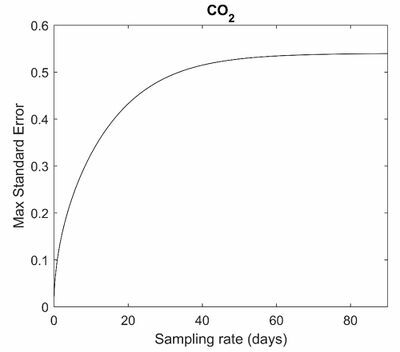 Figure 117 shows the results for a similar exercise using CO2 concentrations. Although based on a relatively small number of surveys, these results likely reflect the higher biological activity (plant and microbial) in the main spring and summer growing seasons compared with lower levels of activity in the autumn. They support previous studies (e.g. Beaubien et al., 2013) in suggesting that the autumn is the optimal time for detecting any emissions resulting from shale gas (or other) operations as natural background is at its lowest. 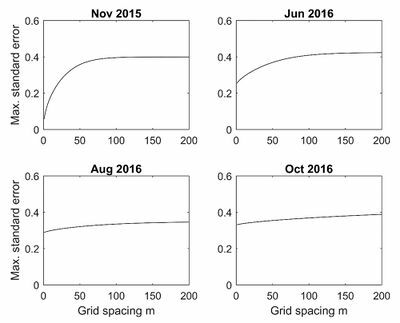 The variation in error with grid spacing was again more significant for spring and summer surveys. The errors associated with the relatively wide spacing of soil gas and flux measurements (200 m) will be offset by the lower errors arising from more closely spaced mobile laser data (typically 10 m spacing). Figure 117 Standard errors for spatial log (CO2 conc + 0.2) predictions at the centre of 81- point regular square grids of different sizes. Units are log (%). The same approach can also be used to assess the implications of different temporal frequencies of measurements using the data from the continuous CO2 flux and concentration monitoring stations at KM8 and a farm to the east, respectively. In this case, we predict the gas variable half-way between two measurement times and consider the implications of increasing the gap between measurements (Figure 118 and Figure 119). The benefits of a high frequency of measurements are evident in each case. A very low standard error applies at the 1 hour rate of sampling used for the soil gas and flux measurements and would also be expected for the 30 minute averages derived from the very high (10 Hz) data acquisition rates of the eddy covariance system. Figure 118 Standard errors for temporal log (CO2 flux + 0.2) predictions at the time midway between two measurements as a function of time between measurements. Figure 119 Standard errors for temporal log (CO2 concentration + 0.2) predictions at the time midway between two measurements as a function of time between measurements. In conclusion, now that datasets illustrating the spatial and temporal variation of gas concentrations and fluxes are available we are in a position to use geostatistical techniques to estimate the expected errors that will result from spatial or temporal prediction of these properties over any specified scale under the assumption that these future surveys follow the same patterns of variation. This can be used to guide future surveys or continuous measurements and the analysis can be refined by incorporating the data from that monitoring. The data collected continue to show the seasonal variability in baseline soil gas and flux values. They also reveal shorter-term diurnal changes and event-driven variations, for example related to the passage of weather systems. The longer time series data and the preliminary geostatistical appraisal of selected data continue to demonstrate that any emissions related to shale gas operations will be easiest to detect in the autumn when baseline biological activity is lower, but the soil remains dry. Saturation of the ground in the winter months precludes free gas measurements. Earlier survey data from the Vale of Pickering, and other studies (e.g. Beaubien et al, 2013; Romanak et al., 2012), has shown that gas ratios can be useful in separating different source of gas e.g. CO2/O2 and CO2/N2 can distinguish deep gas from shallow biogenic gas and CO2 produced from CH4 oxidation. However, dissolution of CO2 in pore water can blur these distinctions. A very recent paper (Györe et al., 2018) demonstrates the potential value of additional ratios (C1/C2+C3) and stable C isotopes in differentiating deep and shallow gas. Additional measurements and sampling (with laboratory analysis of a wider range of gases and isotope analysis) would help to identify any baseline deep gas present and allow better characterisation of the baseline. BGS is significantly upgrading its soil-gas monitoring capability. A high precision CH4, CO2, O2 and H2O analyser and upgraded laser CO2 and CH4 analysers are expected for delivery by April 2018. Additional survey measurements using these instruments would further enhance the baseline dataset and allow a direct comparison with measurements with the same equipment during shale gas operations. Further survey data (and continued time series monitoring) could be used to extend and refine geostatistical analysis to optimise future monitoring strategies in the Vale of Pickering, Lancashire or any subsequent areas of shale gas development. The new lasers can be used in scanning mode for continuous measurements and there is scope to deploy these for periods at KM8, elsewhere in the Vale of Pickering or in Lancashire. The optimal siting would depend on developments at the shale gas sites. For example, the erection of a high sound barrier at KM8 creates very enclosed conditions with turbulent air flows at the site and this can cause serious problems when co-processing gas concentration and 3D air flow data. ↑ Ward, R S, Smedley, P L, and Allen, G et al. 2017. Environmental Baseline Monitoring Project: Phase II — Final Report. Report of the British Geological Survey. OR/17/049. http://nora.nerc.ac.uk/id/eprint/517889/. ↑ Smedley, P L, Ward, R S, Allen, G, Baptie, B, Daraktchieva, Z, Jones, D G, Jordan, C J, Purvis, R M, and Cigna, F. 2015. Site selection strategy for environmental monitoring in connection with shale-gas exploration: Vale of Pickering, Yorkshire and Fylde, Lancashire. British Geological Survey Open Report, OR/15/067, pp. 22. ↑ Webster, R, and Oliver, M A. 2007. Geostatistics for Environmental Scientists, 2nd Edition. John Wiley and Sons, Chichester. ↑ Lark, R M, Cullis, B R, and Welham S J. 2006. On spatial prediction of soil properties in the presence of a spatial trend: the empirical best linear unbiased predictor (E-BLUP) with REML. European Journal of Soil Science, Vol 57, 787–799. ↑ 5.0 5.1 Beaubien, S E, Jones, D G, Gal, F, Barkwith, A K A P, Braibant, G, Baubron, J C, Ciotoli, G, Graziani, S, Lister, T R, Lombardi, S, Michel, K, Quattrocchi, F, and Strutt, M H. 2013. Monitoring of near-surface gas geochemistry at the Weyburn, Canada, CO2-EOR site, 2001–2011. International Journal of Greenhouse Gas Control, Vol. 16, Supplement 1, S236–S262. ↑ Romanak, K D, Bennett, P C, Yang, C, and Hovorka, S D. 2012. Process-based approach to CO2 leakage detection by vadose zone gas monitoring at geologic CO2 storage sites. Geophysical Research Letters, Vol. 39, L15405. ↑ Györe, D, Mckavney, R, Gilfillan, S M V, and Stuart, F M. 2018. Fingerprinting coal-derived gases from the UK. Chemical Geology, Vol. 480, 75–85.